A trend that's make its way into stores and home interiors, restuarant decor and has now become a striking new trend in wedding cakes is chalkboard inspired wedding cake designs. These quirky wedding cakes have become a huge hit amongst the soon to be newly weds. What's not to love about edible chalkboard, right? We have fallen in love with some of these chalkboard cake decoration ideas and had to share em with you. Perfect for a beach destination wedding or a rustic barn wedding, these cakes will become conversation starters at any gathering. In fact, you don't have to think of how this cake fits into your theme. These are versatile enough to be incorporated any place, anywhere. Wondering how do you eat chalkboard? These are nothing but black fondant cakes with a chalkboard effect. What you choose to write on them is entirely your choice. Whether it’s your wedding initials, wedding date, or a timeline from the first date to the wedding or just your wedding vows, think of these as blank canvas. And, now you’re thinking, do we really use a chalk to write on it? No! Frozen white candy melts or icing whiteners are used to add the writing details. Cool and sweet, isn’t it! Grab all the inspiration you can get as we share some cool chalkboard cake decoration concepts that'll make your wedding cake stand out and will make your guests stand up and take notice. Can't wait to cut and eat these beauties! Add a small little chalkboard frame! One tier of chalkboard wedding cake, can also make a great impact! 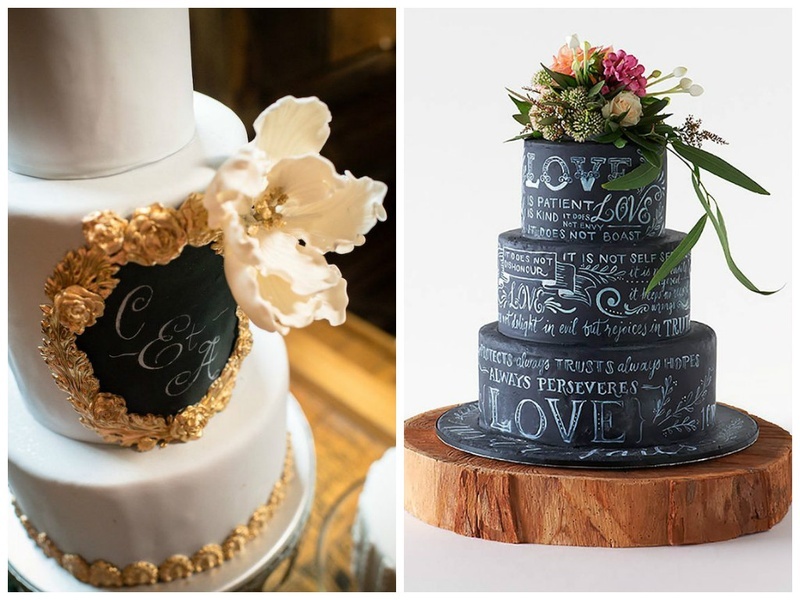 Make the whole chalkboard wedding cake your blank canvas! Fill it out with your wedding vows or just cute little love notes. And, who says a chalkboard need be black! > Incredibly Awesome Wedding Cakes You Would Want to Frame Than Cut! > Wedding Cupcake Ideas: How to Match Your Wedding Theme?